Have you been searching the web for wooden display cases that are good quality and not ridiculously priced but to no avail? Well, look no further. 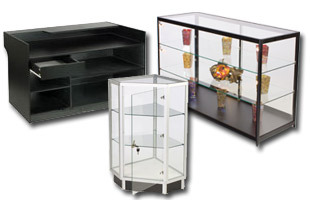 These wooden display cases are made with the finest materials, and are very competitively priced! Many of these glass cabinets are priced well below any of the competition. These wooden display cases are perfect for displaying jewelry, trophies, collectibles, medals, flags and other precious items. There are hundreds of solid wood cabinets for sale within this online catalog, ensuring customers will find retail counter, or fixture to coordinate with existing décor. Many of these wooden display cases are offered in several wood finishes, as well as black and silver. All of the glass used in these units is tempered. By using this type of glass, the fixtures are much more safe and less of a liability if used in a public environment. Most of these wooden display cases feature overhead lighting, while others are offered with additional track lighting. The additional illumination helps to highlight specific items for an added effect. 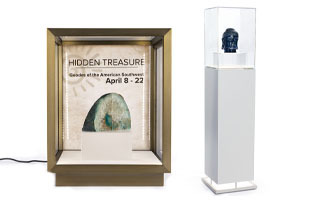 There are wooden display cases for sale here in several shapes and sizes such as; square, hexagonal, round, and rectangular. Be sure to ask a representative about different delivery methods offered here. 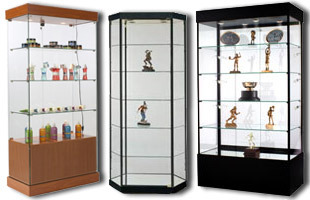 Use these wood display cases to showcase such items as; jewelry, model cars, flags, figurines, or other memorabilia. In addition to the vast selection of cabinets available here, there is also a complete line of countertop units here with wooden trim. 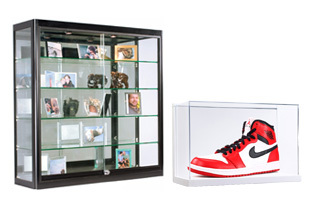 These wood display cases feature a thick acrylic lid with a cherry finish molding, to create a fancy box to showcase individual sports collectibles, trophies, dolls or any other cherished items. The retail fixtures for sale here feature many beneficial features for any store, such as locking cabinets, adjustable shelves, and extra storage space. 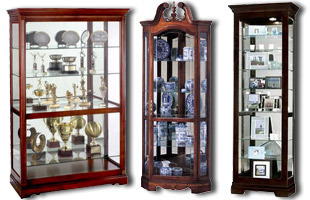 These wood display cases will surely add a touch of class to any existing furniture. This online selection also includes an extensive selection of cabinets suitable for residential use. Many homeowners have at least one wooden display case in their home to exhibit a collection of items, such as model trains, autographed sports items, trophies and other collectibles. These curio cabinets are available in many sizes and styles to accommodate most any taste in furniture. This wooden display case selection also includes a few corner units. There are also several display cabinets here that feature adjustable shelving and overhead lights. Buy a wood display case today and discover why this is the nations preferred supplier of commercial and residential fixtures! Does this wooden display case ship assembled? The majority of the cabinets offered here ship fully assembled on a pallet. There is a wooden display case sold here that ships unassembled, for example; some of the retail sales cabinets. Many of the trophy cabinets require the glass shelving to be installed prior to use. What are the available shipping methods for this wood display case? Approximately 99% of these glass cabinets ship via freight. Only the smaller sales counters that ship unassembled have a ground shipping option. This wood display case selection can be shipped via freight with many delivery options, such as dock to dock or premium service that includes product placement and removal of all packing materials. There is sure to be a delivery option offered her to accommodate any special needs or standard commercial delivery. A new feature recently added to a small selection of these glass cabinets is the “quick ship” option. Due to customer demand, and a growing need to be able to receive these fixtures in a timely manner; these items are now offered unassembled, and can be shipped overnight via ground shipping. This new option is both cost and time saving for you the customer. The overall cost for the unit as well as the cost to ship the cabinet is much cheaper in comparison to a fully assembled model. Similarly, there are also trophy tower cabinets that are offered with shorter delay times. For example, there are glass cabinets here that are offered with either a 4 or 6 day lead time. The shorter time frame is made possible by requiring the purchaser to complete minor assembly, such as installing shelving, or other small tasks. 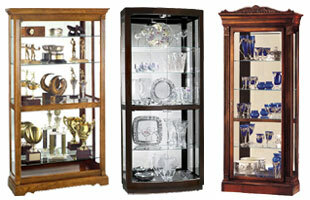 In addition to these solid wood display cabinets there are many other product lines offered here! Some of the other merchandise themes include; bulletin boards, store fixtures, trade show accessories and poster frames, just to name a few. 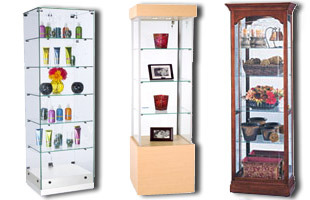 Displays2go has been making and selling point of purchase displays for over four decades now. This company began as a small, one person business, building a few basic acrylic displays, and then selling them to local businesses. Eventually flyers were mailed out, demand grew, and so did the number of returning customers. As the product line was expanded; an actual warehouse was bought, more employees were hired, and the phones haven’t stopped ringing since. With the evolution of the internet, the owners created this website, and began drastically expanding the merchandise selection to include a wide array of displays. Now, nearly forty years later, with a solid foundation, this company continues to flourish and change with the times. Given the current state of the economy, now more than ever companies are concentrating more on finding the best quality for their dollar. With that said; there is a complete section of clearance and overstock items that are updated daily here. As an added bonus to the customer; standard shipping policy is same day shipping on in stock merchandise bought prior to 3PM EST weekdays. For those orders received after the 3PM cutoff, the in stock items are shipped the following business day. Some restrictions do apply with custom artwork, or build-to-order fixtures. With more than 7,000 display products available, this company can satisfy a wide variety of customer needs across many different product lines. This website is the nation's #1 choice for all solid wood cabinets! We appreciate your patronage!